One of our favorite days in Istanbul was when we ventured away from the high tourist areas to visit two other quieter attractions: Kariye Museum (also known as Chora Church) and the old wall of Constantinople (Theodosian Wall). Whenever we travel, I have a moment of "I can't believe I am here", and I start to choke up a bit from amazement of where I am standing (cheesy, but it's true). Walking on the wall was one of those moments (it actually happened a few times in Istanbul). We arrived anyway, so all was good :-) The original building of the Chora Church was built sometime in the 5th century, but since then, it has been destroyed and/or reconstructed at least five times. The current building is full of mosaics and frescoes which dates back to the early 1300's. The decor was in really good shape considering how old it is and that curious people (*cough*Luke*cough*) touch it. Parts of the museum were closed off, so we could only see a few rooms, but thankfully, there were not too many other people that chose to visit. I am sure it helped that there was entrance fee (which was included in our museum pass) and that it isn't too easy to get to. After visiting the Kariye Museum, we had a snack at the cafe just outside of the museum. It wasn't the best of food but who cares when it's a beautiful day! Next, we wandered just a tad bit more uphill to get to the Theodosian Wall. I am so thankful we chose to start at the museum because our walk uphill from the metro was much less gruesome than if we had flipped it around and started at the waterfront (which is what the guidebook recommended). Istanbul has a very extensive history which makes it one of the most unique cities in the world. Several sets of walls have been built under different leaders: Serverus, Constantine I, Constantius II, and Theodosius II. The walls were originally built in the 4th-5th century to protect the city of Constantinople as it became the capital of the Roman Empire. Today, the walls are slowly being restored for visitors to enjoy. There were a few sets of stairs (with no railing) where visitors could climb to the top to walk on the 12 meter (39 feet) wall. Several parts of the wall are in ruins, so you can only walk so far before you come to a drop-off. It is not the safest activity especially since it is very windy on top, but the stairs and wall are pretty wide so only only a true idiot person could really fall off. I had no idea that there would be an amazing view when we got to the top! 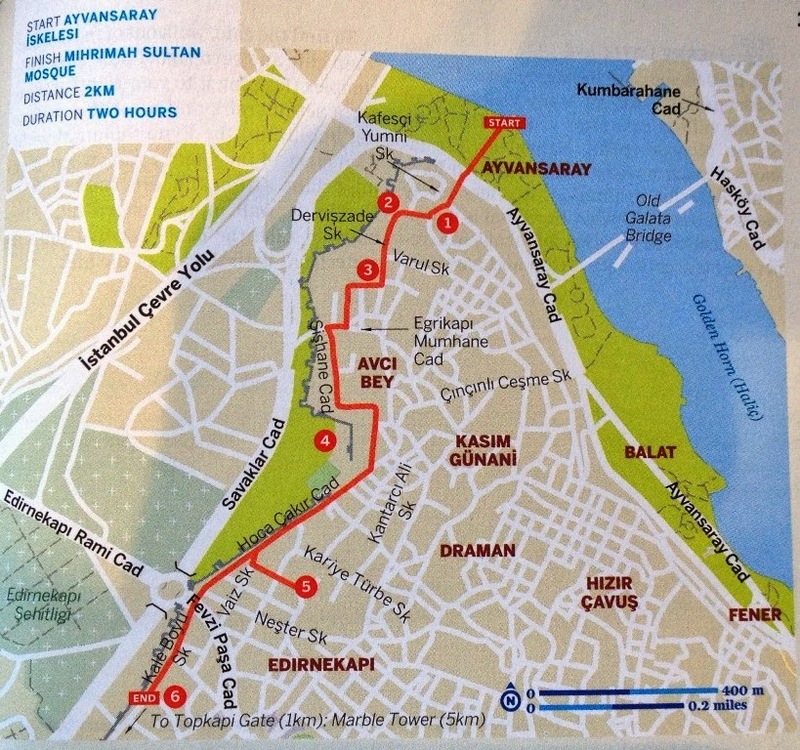 I really wanted to visit Pierre Loti hill, but we didn't have time (nor enough money on our Istanbulkarts [transport cards] for the journey), so we wandered in Balat Parkı while we waited for our ferry back to Eminönü. But I will talk about our ferry journeys in my next post about Istanbul. April 6th, 2014 was one of my most favorite days of my entire life! Istanbul has never hosted the Olympic games. It was runner-up for the 2020 games, losing to Tokyo. The city plans to campaign for the 2024 Olympics. Did y'all know that Rio de Janeiro is way behind in their preparations for the 2016 Summer Olympics? Although highly unlikely, if Rio doesn't get their act together, the games could be hosted in London again.